A small rectangular, secularised chapel in the parish of Yapton, which is C13 or C14. In the Middle Ages, outlying chapels were often abandoned if no longer required, whilst others, more fortunate, became full parish churches. Bilsham, in Yapton parish, belongs in the first category. It is said to have been ‘prostrate’ by 1551 and without services (Dallaway II p47). Its later history is obscure; by the mid-C19 it had become two labourers’ cottages and the once extensive churchyard was meadowland (SAC 12 (1859) p104). In 1878 it was unoccupied and work was done in the unrealised hope of restoring it to parochial use (1 p200). It subsequently degenerated into a shed but in 1972 was restored as a house. Though there was a pre-Conquest settlement at Bilsham (VCH 5(1) p247), the chapel, a single cell structure of flint rubble without a chancel, looks on the evidence of the two pairs of lancets and a plain pointed doorway on the north side to be C13. However, the Y-tracery in the east window is usually an earlier C14 feature, so the north lancets and doorway, though conservative for the date, may be of the same period. There was never a west window (SAC 12 ibid), so the two vaguely ecclesiastical ones at first floor level that are there now must have been inserted during the work of 1878, if not later. 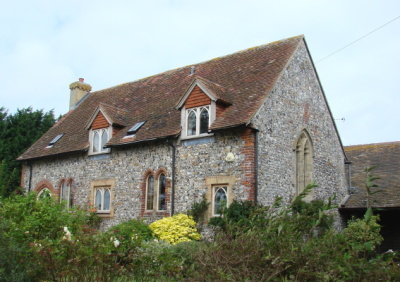 Work done in 1878 (1 ibid) included a new tiebeam roof and two pairs of lancets and a doorway in the wholly rebuilt south wall, which has brick dressings. The work in 1972 that turned it into a house also uses brick and the two dormers presumably date from then. The interior, which was partitioned, is inaccessible.